CULLMAN COUNTY – “Kids Loving Kids” (KLK) a charity program that gives young people the opportunity to help out peers in need, has needs of its own this Christmas season. With plans to assist 500 families in Cullman, Walker and Winston Counties this year, the program has found itself way behind on donations. In spite of high numbers of students from low-income homes, several county schools have decided to take part and help out. Harmony, Holly Pond High, Vinemont Middle, Vinemont High and the Cullman Area Technology Academy (Career Center) are all collection points for the ministry. In a message to The Tribune, Maske wrote that “KLK is a 501(c)(3) nonprofit organization that encourages kids and teens to love and give back to others in need. If we train kids to love by giving at an early age, bullying, suicide, racism and other negative factors in our country will disappear. Love is the Foundation and Giving is an Action of Love! Last year, KLK served over 500 families in the three counties. The needs for this year are even greater so Harmony kids said Yes to Bridging the Gap of Love for those in need! 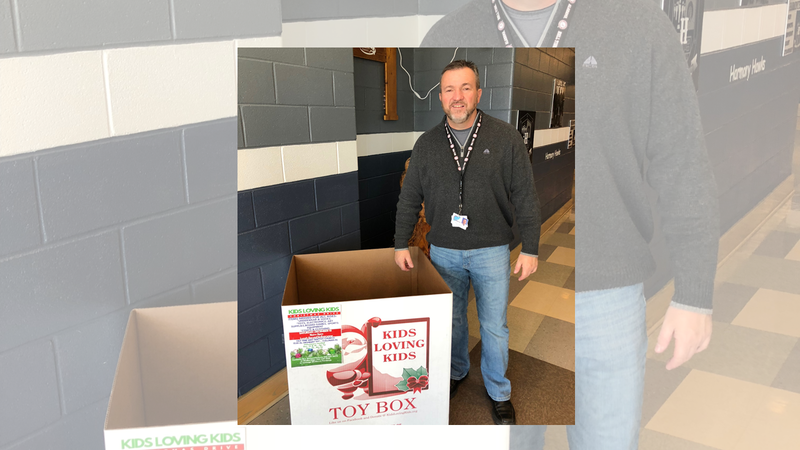 “The KLK Collection Drive is nearing a crucial holiday deadline for clothes and toy donations, with many of its collection boxes empty with less than two weeks to go. KLK is seeking volunteers to meet at Ole Time Way Baptist Church at 1530 Alabama Highway 157 in Cullman to process items from 9 a.m. to 7 p.m. on Dec. 13-14. Items will be distributed at the church on Saturday, Dec. 15, from 11 a.m. to 2 p.m., and volunteers will be needed from 9 a.m. to 3 p.m. for that event. Ole Time Way Baptist Church will be serving lunch to families and will also have a puppet show for children. Maske explained about another KLK event: “A separate Kids Loving Kids event is also held in Walker County. Pam (Dodd), who with her husband, Bobby, runs Bobby and Pam Dodd Ministries, understands the financial needs at Christmas and the need for the charity as she grew up in a single-parent family. She understands that parents sometime have to make the difficult decision to spend money needed for bills to purchase gifts for their children at Christmas. That is why this organization was started, so parents do not have to make these difficult decisions during the Christmas season. There are people that want to help. “The no. 1 items requested by children and by teenagers are underwear, and socks, which we ask are purchased as new in all sizes for children and teenagers. Kids and teens love snuggle blankets because a lot of these children are from single-parent homes where the mom, dad or whoever they live with have to be at work and these snuggle blankets really comfort them. Items accepted include new or slightly used shoes, toys, electronics, art supplies, books, puzzles, journals, board games, sports, fishing and hunting equipment, coats, pajamas, hats/caps, gloves, personal care items, gift cards, clothing, blow dryers, hair care products, nail polish and make-up. Donations left over from the clothing will be given to Curt’s Closet in Cullman. For more information about KLK, contact Pam Dodd at 256-318-4555 or pamdodd3@gmail.com or visit www.facebook.com/KidslovingKids/. Checks can be written to Kids Loving Kids. Donations may also be made through PayPal at paypal.me/bpdministries or at Kids Loving Kids at Traditions Bank. For more information about the distribution event at Ole Time Way Baptist Church, contact Dodd or the Cullman coordinator Shelba Edge at 256-339-0135.